Northumberland is in the North East of England and is the ideal destination for a holiday, short break or weekend getaway. The log cabin holidays in Northumberland are perfect if you want to a good value holiday accommodation in the best areas and with some fantastic facilities. There are great places to visit and explore in Northumberland and you will find log cabins near to these. 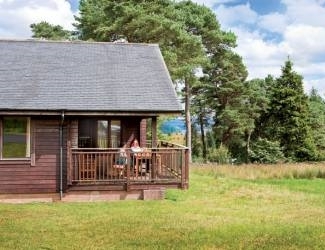 Areas such as the Northumberland National Park, Kielder Water and Forest and of course the incredible coastline all have log cabins in or within easy reach. Below you will find a range of log cabins in Northumberland with a mix of contemporary self catering accommodation, facilities and a range of superb cost effective holidays, short breaks and weekend reatreats. 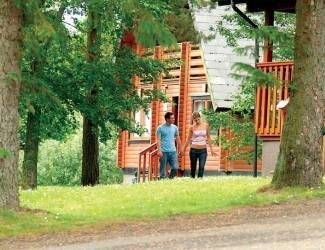 This is a relaxing log cabin park in Northumberland and on the edge of Kielder Water and the Kielder Forest Park. The relaxing setting is ideal if you want to enjoy a range of leisure pursuits such as walking, mountain biking, bird watching or want to visit local sights and attractions. There is a range of faciliites available and this includes an indoor hydrotherapy pool, sensory room, suana, lounges and bar, childrens play area and much more. Calvert Trust Kielder has one accommodation choice and this can sleep up to seven people and is a luxury log cabin with three twin bedrooms (or one double and two twins). If you are looking for a lodge park in Northumberland on the banks of Kielder Water then look no further than Kielder Water Lodges. This superb log cabin retreat gives you over 27 miles of fantastic shoreline to explore either by foot or by bike and the stunning Kielder Forest. You will not be short of facilities when you choose to stay here and some of the features include an indoor swimming pool, childrens adventure playground, fishing, boat hire, water based pursuits and much more. There are seven log cabins at Kielder Water Lodges and these sleep from four to six people. All the log cabins have great features to ensure you will feel relaxed and have everything you need for a self catering holiday or weekend break. The park has also won the Gold David Bellamy Award for Conservation to ensure you will be staying in a natural environment in keeping with the surroundings of the Forest Park and Kielder Water. This is a stunning 40 acre park setting ideal for log cabin short breaks in Northumberland and holidays with family and friends or just the two of you on a romantic retreat. The quiet nature of the park provides the ideal backdrop for a holiday in Northumberland and with a choice of four log cabin accommodations sleeping up to eight people you can find the ideal self catering holiday whenever you choose to come away. Felmoor Country Park is not about facilities and as such these are limited and you will find a clubhouse with bar and BBQ hire should you want it. Some of the log cabins have lake views and they all offer a contemporary self catering living space with plenty of features and mod cons. Are you looking for log cabins with hot tubs in Northumberland? If so then Border Forest Lodges has a choice of self catering log cabins with outdoor hot tubs in an attractive setting on the edge of the stunning Northumberland National Park. The park setting is perfect if you want some peace and quiet and a base to explore the area or just to simply relax and unwind. There is a choice of three accommodations at Border Forest Lodges and they provide a well presented and contemporary self catering living space with decking areas, hot tubs and views over the Border Forest. There are dog friendly options available and these are charged at a very reasonable £15 per week. You can choose from a wide range of long weekends, short breaks and holidays and the park is open throughout the year. 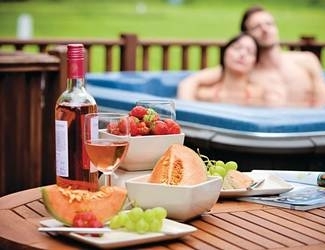 The ideal place to enjoy Northumberland hot tub holidays and breaks in a quiet setting staying in log cabins. The log cabins are set in the Whitfield Estate and there is over 12,500 acres of grounds to enjoy. The log cabins are in a quiet and secluded area of the country estate and provide a contemporary self catering base. There is a choice of log cabins with hot tubs to sleep four to six people and they are packed with features. Whether you want to enjoy one of the romantic hot tub breaks in Northumberland or you just want to getaway with your family or friends a stay here will leave you refreshed and relaxed. There are also dog friendly log cabins and pets are charged at just £25 per week. 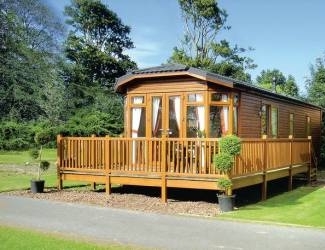 With a perfect setting between the coast and the Northumberland National Park you can have the best of both worlds when you choose Bockenfield Country Park as your log cabin getaway. The park setting is naturally beautiful with a haven of birds and wildlife enjoying the woodland park. There is a choice of log cabin accommodations and these can sleep up to six or eight people. Features include well equipped kitchen area, double glazing, central heating and a verandah with outdoor furniture.